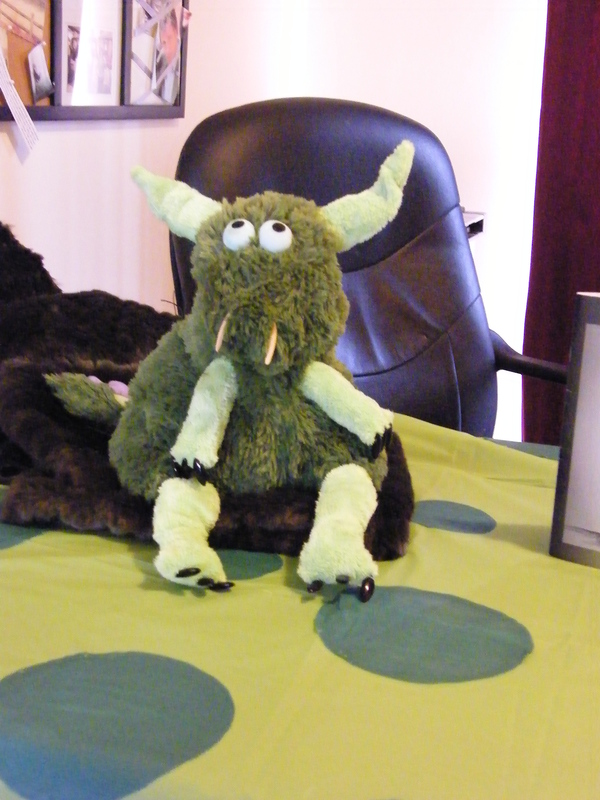 I asked permission to be involved in this blog hop mainly because my monster isn’t that scary! Rumble was inspired by a Halloween prompt run by my writers circle. I could have gone down the route of scaring the ‘you know what’ out of my readers but decided to flip the idea around. What if the view point was from the monster’s perspective? Thus Rumble was born, living in his dark, moist underground and root adorned home. 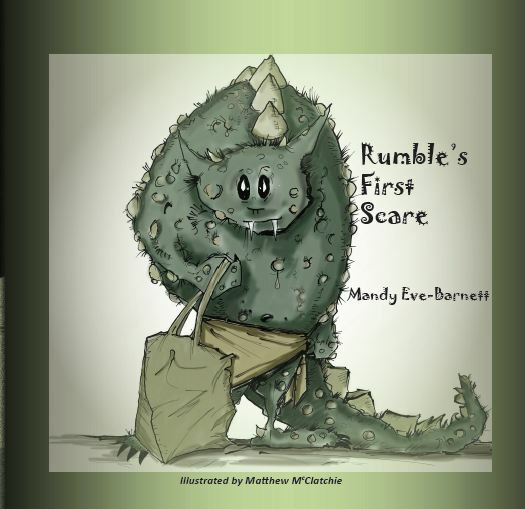 In the story we follow Rumble as he is taken by his mother on his very first scaring expedition. He had been told of All Hallows Eve, of course but until now had not been old enough to participate. Rumble emerges into the upper world to find a shockingly bright and a hard surfaced environment. With his mother’s guidance he scares several children and has a very enjoyable time. Whether read to a child or given as a gift – children love little Rumble and his bag of pets. I actually made a Rumble for promotional purposes and everyone is drawn to him – he behaves very well and loves all the cuddles. The thrill of being scared with adrenaline rushing through our veins has been theorised as a primitive need. In our modern daily lives there is little to fear, in the most part. Obviously there are exceptions to this related to location and family environment but to be so scared our ‘fight or flight‘ instinct comes into play is rare. Emotional extremes are suppressed now-a-days and the ‘normal’ mechanics of our bodies dampened. In the definition of fight or flight, it is the body’s response to perceived threat or danger. During this reaction, certain hormones like adrenalin and cortisol are released, speeding the heart rate, slowing digestion, shunting blood flow to major muscle groups, and changing various other autonomic nervous functions, giving the body a burst of energy and strength. Originally named for its ability to enable us to physically fight or run away when faced with danger, it’s now activated in situations where neither response is appropriate, like in traffic or during a stressful day at work. When the perceived threat is gone, systems are designed to return to normal function via the relaxation response, but in our times of chronic stress, this often doesn’t happen enough, causing damage to the body. When we watch a scary movie or read an intense thriller, our bodies react giving us the rush we crave but in a safe environment. A foot note – I define a word each day on my blog and today’s was – Infatuated – definition: to be filled with a foolish or excessive love or admiration. Surely we can all recall several creepy and menacing characters in our favorite horror movies that had this particular trait. I enjoyed this post as it took you from the lovable Rumble to interesting facts of the human condition. Great information sharing – thank you!